This feature is currently only available for Polls and Recruiters. 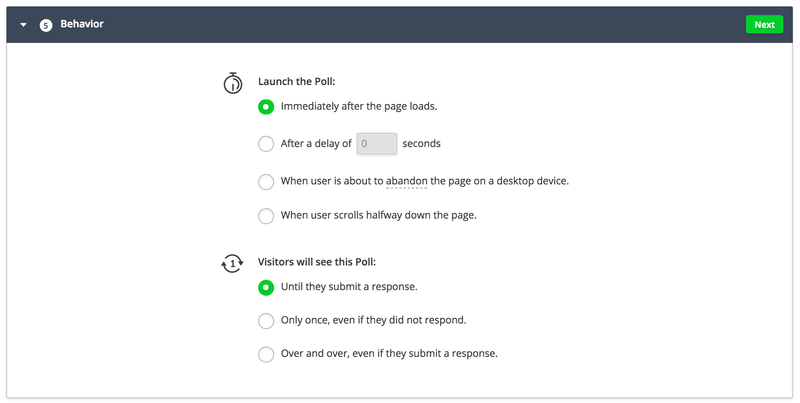 Hotjar allows you to set how persistent a Poll or Recruiter widget should be to visitors. The Persistence Behavior options are available under step 5 - Behavior. Until they submit a response. This is the default option. The widget will show to the targeted visitors until they submit a response (or collapse it). Only once, even if they did not respond. This option will make a widget only show ONCE for every visitor. Over and over, even if they submit a response. This option allows you to show the same widget multiple times to the same visitor if they fit the targeting parameters you define. This is great if you have a multi-page process and want to collect feedback on more than one step of it.